Pixel Scroll 4/22/17 Get Out Of There At Once! The Pixels Are Coming From Inside The Scroll! (1) CON REPORT. Outer Places went to Steve Wozniak’s comic con — “The SVCC Tech Showcase Was Filled With Robots and Supercars”. Second only to the Woz himself, the night’s biggest show-stealer was SoftBank Robotics‘ Pepper the Robot. The machine is designed to be able to accurately perceive emotions, and is currently being marketed as a personal assistant in Japan. Tonight, Pepper mostly just rolled up to people and requested they take a selfie with them – that may sound like a waste of Pepper’s talents, but any robot who can perceive emotions would eventually realize that humans enjoy doing really silly things. So before the robots take over, we’ll take selfies with them. (2) CAPTAIN KIRK. Of course, that may be underestimating William Shatner who was at SVCC yesterday, too — “William Shatner delights fans at Silicon Valley Comic Con” . Watch the KGO news video at the link. From “Star Wars” to “Star Trek” and everything in between, the second annual Silicon Valley Comic Con did not disappoint on its opening night. In addition to costumes and cosplay fans were treated to an evening with Captain Kirk himself, William Shatner. (3) SOMEBODY’S WRONG ON THE INTERNET! The Fargo/Hugo Award identification continues to outrun the correction – as per usual in social media. But I’m impressed how many people know what a Hugo is. By comparison, it’ll be a cold day in Fargo Hell before the masses think they recognize a Dragon Award being used as a murder weapon on TV – take that, Puppies! Watched ep1 of #fargoseason3 – does the police chief pick up a #Hugo award as a weapon while checking her stepdad's house for that intruder? Finally watched the new #Fargo episode. What were those books in the safe? And was that a Hugo award she picked up to use as a weapon? (4) SCIENCE’S SIBLING RIVALRY. Star Trek, Arrival, linguistics, and “soft” science versus “hard” science: “Uhura Was a Comms Officer: Why Linguistics Matter”. This is a succinct rendition of how language study tends to be viewed by those outside of it: that the scientific study of language isn’t science. This also, of course, ties into other things (such as sexism and whatnot, plus trying to use dialogue as characterization in media) but detailing such factors is beyond the scope of this article; suffice it to say, Arrival tries to detail the work of documenting and recognizing patterns of a completely unfamiliar system. (5) WELCOME TO MARS, NOW DROP DEAD. Daily Mail, which enjoys such a reputation around here, warns “Visitors to Mars Will Die in Under 68 Days”..
…One of the most important conclusions of the research is that neither crops nor oxygen generated for the inhabitants will be sufficient to support life for long. A fatal fire is also a major risk. Mars One is an ambitious plan by a Dutch entrepreneur to send people to Mars next decade and start building a colony there. The proposal has received fierce criticism for its lack of realistic goals, and now one study has dealt the team a crushing blow – by saying the colonists will begin dying in 68 days. Low air pressure, habitats at risk of explosion and a lack of spare parts are among the potentially fatal dangers that apparently await anyone who makes the inaugural trip. The experiment is testing “active geolocation”, which is when you try to figure out where a computer physically is by measuring how long it takes a packet of information to go round-trip between one computer and other computers in known locations. This has been studied carefully within Europe and the continental USA, but much less so elsewhere. I have run these measurements myself on many VPN servers, but I don’t know how accurate they are, and the accuracy varies depending on the true location. By visiting this page, running all the way through a measurement, and then telling me honestly where your computer really is, you provide me with data that I can use to calibrate the VPN measurements. Again, data from places other than Europe and North America is especially helpful: I particularly want Asia, sub-Saharan Africa, and South America. (7) CHARLES VESS. Coming this fall, an art book by the master — “Charles Vess Has An Original Art Edition of The Book of Ballads”. From Neil Gaiman’s retelling of “The False Knight on the Road”, to Jeff Smith’s “The Galtee Farmer”, and Jane Yolen’s “King Henry” – Charles Vess’ The Book of Ballads brought new visions of the classic folktales from the brightest New York Times bestsellers, award winners, and masters of science fiction and fantasy together with stunning art from Charles Vess. With this new The Boo of Ballads Art Edition, get ready to experience the stories anew! Hits comic stores September 13, 2017 and bookstores on November 10, 2017. (8) SQUEE DOWN UNDER Ryan K. Lindsay is an excited Aurealis Award winner. Told a mate I won this award and he went crazy. "That's like an Australian Hugo award!" I leapt up all excited, "I know, right?!" (10) MARCHER FOR SCIENCE. Given what a lot of you think about the Daily Mail, why wouldn’t most their coverage of the March for Science in London revolve around Doctor Who’s Peter Capaldi? Except that you think it’s a good thing, don’t you. Fess up! 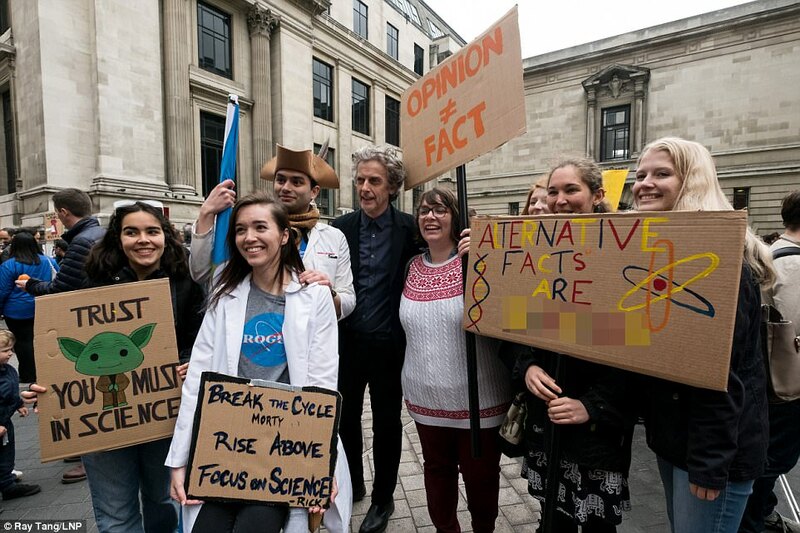 Doctor Who star Peter Capaldi joined physicists, astronomers and biologists at the March for Science as protesters paraded past London’s most celebrated research institutions. Leading figures used the occasion to warn Britain’s impending divorce from the continent could compromise their work by stifling collaboration with overseas colleagues. Organisers claimed 12,000 people joined the London event, as hundreds of similar protests took place around the globe, from Australia to the US. Somebody needs to say it: What’s Doctor Who but a show that glorifies fake science and boasts a stunning lack of internal consistency? Yes, I love it, too, but let’s not get confused about what happens every episode…. April 22, 1953 – Sci-fi horror movie Invaders From Mars was released on this date. April 22, 1978 — The Blues Brothers make their world premiere on Saturday Night Live. (13) SEE THE AUTHORS. Here are Ellen Datlow’s photos from the April 19’s Fantastic Readings at KGB with Laura Anne Gilman and Seth Dickinson. (14) HEAR THE AUTHORS. At the next Fantastic Fiction at KGB on May 17, hosts Ellen Datlow and Matthew Kressel present E.C. Myers and Sam J. Miller. E.C. Myers was assembled in the U.S. from Korean and German parts and raised by a single mother and a public library in Yonkers, New York. He has published four novels, and short stories in various magazines and anthologies, including Space & Time Magazine, Hidden Youth: Speculative Stories of Marginalized Children, and Kaleidoscope: Diverse YA Science Fiction and Fantasy. His first novel, Fair Coin, won the 2012 Andre Norton Award for Young Adult SF and Fantasy, and YALSA selected The Silence of Six as one of its “Top Ten Quick Picks for Reluctant Young Adult Readers” in 2016. His next book will be DoubleThink, a collection of stories related to The Silence of Six from and he continues to write for ReMade, a science fiction series from Serial Box Publishing. Last month we published a video arguing the case for circular runways at airports, as part of a series called World Hacks. It took off and went viral. The video has had more than 36 million views on Facebook and generated heated debate on social media – including within the aviation community. Many people are sceptical about the concept. So we decided to hand-pick some of the top concerns and put them straight to the man proposing the idea: Dutch engineer Henk Hesselink. This is what he had to say…. (16) GET YOUR TISSUES READY. Nerdist has photos — “Little Jyn Erso Cosplayer Delivers Death Star Plans to Leia at STAR WARS Celebration”. Harley and her dad made the data cards as a fun activity for the convention. Harley loves interacting with other people, and they thought this was a fitting tribute to their love of Star Wars and Fisher. As Harley ran into Leia cosplayers of all variety of ensemble, she handed over the Death Star plans. I don’t know how many Leia cosplayers were moved to tears by this act, but I’d wager it wasn’t a small number. (17) KAMIKASSINI. Cassini sets up for final plunge: “Cassini probe heads towards Saturn ‘grand finale'”. In the years that it has been studying the Saturnian system, the probe has flown by the haze-shrouded world on 126 occasions – each time getting a kick that bends it towards a new region of interest. And on Saturday, Cassini pulled on the gravitational “elastic band” one last time, to shift from an orbit that grazes the outer edge of Saturn’s main ring system to a flight path that skims the inner edge and puts it less than 3,000km above the planet’s cloud tops. The probe will make the first of these gap runs next Wednesday, repeating the dive every six and a half days through to its death plunge, scheduled to occur at about 10:45 GMT on 15 September. The probe is scheduled for deliberate destruction to avoid any risk of it hitting and contaminating a Saturnian moon. (18) APOLLO 13. Now there’s a documentary about “The unsung heroes who prevented the Apollo 13 disaster”. Two days into what should have been a mission to the Moon, disaster struck Apollo 13. A new film explores the drama – and astronaut Jim Lovell recounts the incredible efforts to bring the crew back…. These tanks, in the spacecraft service module, were Liebergot’s responsibility. They held oxygen and hydrogen, which was converted to electricity and water in three fuel cells – powering the capsule and providing the astronauts with drinking water. The routine instruction to turn on stirring fans was to make sure the liquid in the fuel vessels was properly mixed, to ensure the gauges gave accurate readings. Swigert flicks the switches for the fans. Two minutes later, there is a bang and the master alarm sounds. That eight-hour shift would eventually end three days later. According to Unesco, 29% of people in scientific research worldwide are women, compared with 41% in Russia. In the UK, about 4% of inventors are women, whereas the figure is 15% in Russia. Russian girls view Stem far more positively, with their interest starting earlier and lasting longer, says Julian Lambertin, managing director at KRC Research, the firm that oversaw the Microsoft interviews. (20) PUB SIGN. 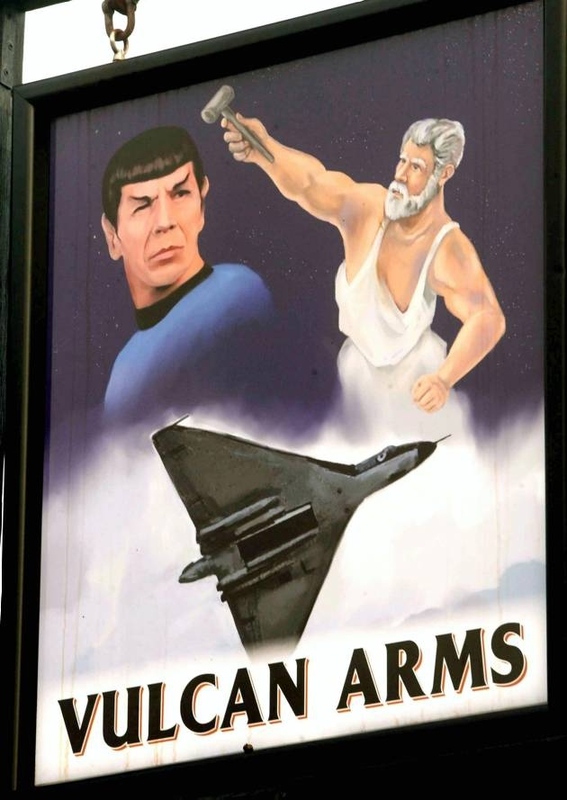 Catching up on the news from 2011 — “Sizewell: Unique pub sign scoops top award” in the East Anglian Daily Times. His unique creation features three variations on the vulcan theme – the Roman god, the delta-winged jet aircraft and the TV character Mr Spock. Mr Fisk, who has been at the pub since 1997, decided to create a new sign after the old one was hit by a lorry around 18 months ago. (21) HOLD EVERYTHING. In “Love in Public” on Vimeo, Noah Malone explains what happens to relationships when talking club sandwiches give gratuitous advice. This entry was posted in Pixel Scroll and tagged Apollo 13, Arrival, Cassini, Chip Hitchcock, Doctor Who, E. C. Myers, Ellen Datlow, Fantastic Fiction at KGB, Hugo Awards, Mars, Matthew Kressel, Peter Capaldi, Sam J. Miller, Steve Wozniak, William Shatner by Mike Glyer. Bookmark the permalink. @Cat Eldridge: Something I’m still confused about, despite having tried to keep up with the news on the whole mess… apologies if I overlooked it in one of the previous stories. I know there are plenty of stories of people ordering books from Conlan Press that they never received. But… has CP actually published a book, ever? I mean, I know they’ve put out some e-books and posters, but—anything consisting of multiple pieces of paper bound in a cover? Their website seems to have no back catalog at all, just books “coming soon” to preorder. It’s hard for me to imagine that they got by for 10 years putting literally nothing into print; even if their intent was entirely fraudulent, how hard could it be to do some tiny book project just for appearances? But I can find no evidence of any such thing. Well, I had been debating whether or not to get the Unicorn Humble Bundle. Hearing about Peter S Beagle decided me. Many new businesses lose money at the outset. How would you show Castalia House is paying the owner enough to make it a professional entity? We’re getting into weird territory when a fanzine is a prozine that’s operating at a loss. That sounds like a back door to get LOCUS back on the ballot. The gap is so big, I don’t think anyone else is competitive. You can see that if you look at the semiprozine section of my estimates for puppy-free nominations in 2016, The Book Smugglers did fairly well, but below that, it drops off sharply. Does it really make sense to have a category that only has three serious contenders in it? There’s no urgency to do anything about it, of course, but I think people ought to be thinking about what to change–probably in conjunction with a change to fix the “Best Editor” categories. Short answer no. Longer answer is still no but deserves explanation. Conlan Press survived because most of Beagle, particularly The Last Unicorn fans, believed that anything he was associated with was A Good Thing Indeed. So they sent money in for pre-orders for books such as the manuscript Peter wrote for one of Trek shows with Sarek in it, or a look at the Bakshi’s Lord of The Rings which he was involved with. And they patiently waited and waited and waited as Peter wouldn’t cheat them, would he? But our Hell spawn is one smooth snake oil salesman who makes you think that he’s really on your side, so no one doubted that soon they’d get what they’d ordered. And years went by this way. Quite some years. And Peter got poorer and poorer as our Hell spawn took more and more of the income Peter should’ve had, so much in fact that Peter would be today, if not certain parties intervened, homeless. I’ve no idea just how much money he took that should’ve been Peter’s so let’s just say a great deal and leave it at that. Final note: the folks at Tachyon Press, Peter’s new publisher, get much of the credit for making sure Preter and his girlfriend have a place to call home. I’m one of those who couldn’t get past the first slog of “Dark Forest”, so all I know of the plot is what I get from Wikipedia. Is that enough to go on? I’ve only read a bit and I’m already confused, but prepared to plow forward to at least p.100. And when he said that, my immediate response was, “Wrong. Because you have to have language first before you can have science at all.” It was a stupid line, and one that no scientist of my acquaintance would ever have said. It is a dumb line, but one might note that it is possible to have language without having something people would call a civilization. rcade: We’re getting into weird territory when a fanzine is a prozine that’s operating at a loss. That sounds like a back door to get LOCUS back on the ballot. In what category? Locus pays for material. Anyway, it helps to understand the current rules if you keep in mind the broader forces shaping them. My opinion has always been that fan awards should go to amateurs. The prevailing opinion in the Business Meeting for at least the last decade has been nothing may be done that would keep a professional writer or artist from being nominated in a fan category for unpaid work, in order to uphold a kind of forced egalitarianism. Outside the business meeting are many fans who simply would rather give a Hugo to somebody they’ve heard of, which is writers. Rev. Bob: – Bought the Cthulhu .99 book you pointed out. My spouse would claim you were my “crack dealer” today. I hear Roy Rogers riding up! Yes, a decent plot synopsis of The Dark Forest will do for Deaths End. Luo Ji from The Dark Forest plays a role in Death’s End but is a side character. The prevailing opinion in the Business Meeting for at least the last decade has been nothing may be done that would keep a professional writer or artist from being nominated in a fan category for unpaid work, in order to uphold a kind of forced egalitarianism. I was wondering about the mood of the Business Meeting on this. I like how semiprozine.org has become the go-to reference on what is eligible for that category. I don’t see how a similar resource could be done for fanzines, though. Have you seen Bill Burns’s eFanzines site? It covers the traditional fanzines, and it’s reputed to be very complete. RSR used it as a resource last year when we thought the Best Fan Art category was tractable. Getting a list of the online fanzines (aka blogs) would be a taller order, of course. A better question might be “to what end?” Given such a list, what would one do with it? I cross compare the semiprozine.org list with the SFWA-qualifying venues to get a much shorter list of the most serious semiprozines. But what would one do with a list of a thousand fanzines? (1) I went to SVCC yesterday and had a swell time. Managed to only buy one graphic novel and one t-shirt, and sold a few old comics, which paid for the t-shirt. The only bad thing I can say is that the gofers are cluuuuueless. Not their fault, but they didn’t seem informed by their supervisors about what they should do. They were almost never able to answer even simple questions. I saw Buzz Aldrin! Great speech. The costume contest was very good. Ran into a bunch of friends. There was a panel about Astro City, which I would have gone to — except it was at the same time as Buzz. I’m sure Kurt will forgive me. (15) Circular runways sound a lot like circular firing squads. (18) Liebergot was a guest at Chicon 2012. (14) HEAR THE AUTHORS. Sam J. Miller has a novel coming out? Wait, two?! Cool! Hmm, the first is for teens, but I’ll have to check it out anyway. I’ve liked several of his short stories a lot. The Art of Starving sounds weird and interesting. His second sounds less weird and is not teen or YA. Of course. I’d have gone to it, too, but I wasn’t there. @ Greg: Getting a list of the online fanzines (aka blogs) would be a taller order, of course. Very much so, because while a lot of fans have blogs, I think that many of those blogs would not qualify as fanzines. My Dreamwidth blog, for example, certainly would not; even though I do talk about fannish things on it, I also talk about a great deal of stuff (politics, personal journal entries, etc.) that isn’t. So then you have to figure out just where the dividing line is between “blog written by a fan which sometimes discusses fannish things” and “blog which, back in the day, would have been a fanzine”. And that’s a topic I wouldn’t begin to want to handle! @Lee – Is Hoaxarama still available? I’m very curious. If so, let me know and I’ll email you. ETA @Kendall – Yes! I’m happy to know others share my good taste! @Lee–In cleaning out a file drawer, my partner discovered a small stack of fannish-related papers. Most of them were obvious candidates for the recycling bin (ancient con flyers, etc. It may be presumptuous of me and I’m sure you probably already know this, but your candidates for recycling might be of interest to some archive that’s SF-interested, for lack of the word I’m trying to remember. As before, forgive me for butting in but if you’re someone who dabbles in genealogy, family history or collect ephemera; the things that get tossed give us palpitations. @Kip W – When ol’ Roy died, I kind of hoped he’d be stuffed and mounted on Trigger. Gene Autry died the same year Roy did, a bad year for singing cowboys. We have a big painting of Roy on Trigger on our floodwall; wherever he was born (probably Cincinnati, but I’ve seen claims for here in Portsmouth OH and for Pactolus KY), he grew up in Scioto County, out on Duck Run. Some of the Slyes buried in Greenlawn Cemetery have tombstones boasting about being related to him. When I was born, we lived in Santa Ana, and my grandparents lived not far. Naturally, I don’t remember any of this, but we apparently went to the Rogers place a time or two in the fifties. Have you seen Bill Burns’s eFanzines site? eFanzines is great. I submitted my fanzines to it when I was in Capa-Alpha and Alarums & Excursions. @Kip W: that’s a great story — and entirely believable. @ kathodus: You want it, you’ve got it. @ Harold: If you can suggest anyone who might be interested in con flyers mostly from the 1990s, that hoary old Libertarian propaganda flyer that used to be on the freebie table at every convention, and a couple of old issues of Con-Temporal (comprehensive con listing by date, targeted to dealers), I can dig them back out of the recycling bin again. What I’ve got that might possibly be of more interest to such an archive (which is why they haven’t been recycled yet) is a large number of old convention program books dating back into the 1980s. Mostly from the Midwestern con circuit because that’s where I was living; more recent ones from the Texas/Oklahoma area. No guarantees on whether or not any specific con’s book is in the pile, and no complete runs AFAIK. I’ve got enough of them to mostly fill a small U-Haul box. If you know of anyone who might want them and would be willing to pay shipping (which will not be inconsequential on that size of pile), please tell me! @chip Shouldn’t that depend on the publisher? My gut feel is that a fanzine is run by amateurs. A house blog is run by professionals, even if the blog for free on that bouse blog. Why does a publisher have a house blog? There maybe different reasons, but PR usually is somewhere on the list. The blogs is advertising, if not for the books (and usually they would announce new books on house blogs) than for the company. Its a presence, that helps fans finding this particular publisher and their books. That is no a bad thing, but its a commercial reason to run the blog and something else than a fan writing stuff wihout any financial incentive. The other thing with Conlan Press is that there was merch at the ongoing Last Unicorn film tours along with the promises of all the other stuff supposedly coming out someday. This helped keep the impression going that the promised items would be delivered. And I won a t-shirt I can pretty much never wear. Which is in itself extraordinarily backhanded. I even thought at the time it was a bit of a weird way to appreciate an author I respect deeply. I wore it a few times before the whole truth behind Conlan Press came out. After which, hearing the severe gaslighting Conlan Press and its boss were putting out about Beagle, basically blaming him for everything they could and painting him as senile, I thought, the shirt only plays into that. I’ve thought of self-modifying the shirt (Striking out “Damn” and putting in “THANK” as a bare start…) but even that seems insufficient to render it a thing I would want to wear anywhere near Beagle. And if I wouldn’t wear it in front of him, I wouldn’t wear it anywhere else. Ugh. The Last Unicorn is such an amazing book! I keep trying to get my girlfriend to read it, but she won’t, because of the fluffy reputation unicorns have. I swear she’ll love it if she ever tries it, and it’s short (which fits well with her lack of reading time). It’s also funny and dark and clever and has that modern meta thing I was a sucker for in college. @ Lenora Rose: The movie came out in 1982. I remember fluffy rainbow unicorns prior to that; in fact, I have a piece of art from the 70s using that as a punch line. And I don’t believe that the novel would have had that kind of effect. This is manufactured history, and I call shenanigans. The book is older than the movie by a fair stretch — but I agree with you about manufactured history. I just dislike that what was basically presented as the prime door prize for the event was a backhanded slap at the author — even before the whole Conlan Press and Cochran’s shenanigans came to light..
Also on this subject, I guess there are no ethical sources for an epub of The Last Unicorn? The last I checked, a few years ago, there was no Kindle version, but now there is, and it’s published by Conlan Press. My physical copy is a paperback which, though it has a cool cover, is old and eventually going to fall apart. Kathodus, in that circumstance, where I own the book, I’ve scanned it myself for personal use. But that’s only viable if you have a good scanner, time, and don’t mind proofreading afterwards for scannos. Circumstance 1: I own a deadtree copy of a book. I scan and OCR it and convert it to an ebook. I now have a physical copy and a digital copy. Circumstance 2: I own a deadtree copy of a book. I find a copy on the internet that someone has scanned and OCRed it and converted to an ebook. I download it and I I now have a physical copy and a digital copy. I see no ethical difference between the two circumstances. I don’t have ethical concerns about downloading a digital copy of something I own already in physical form. I do have concerns about opening files from places or services that offer those copies. @Darren Garrison: I’ve done that a couple of times for books I have packed away and cannot get to and must be able to find something in. But there’s always a way someone profits off a free service on the internet*, and I always wonder who I’m advantaging and who I’m screwing when I do that. *Arkansawyer’s Second Law. This is fun! I’m ready for my Ted Talk, Mr. DeMille. rcade: I do have concerns about opening files from places or services that offer those copies. That’s always been enough to deter me. @Lee – I don’t know if you’re following this thread, but I got the zine in the mail today. Thanks! @Mike Glyer – Is it safe to assume voting is closed for the 1984 Hogus and Blackholes? kathodus: @Mike Glyer – Is it safe to assume voting is closed for the 1984 Hogus and Blackholes? Oh, far from it. I’m confident Elst will still take any donation you want to make in an attempt to sway the final results. And I’m behind him 100%. We are graduates of the Bruce Pelz School of Fannish Economics, after all. My first lesson in that school came at the 1972 Worldcon. Some fan wanted to have membership #2001, and they hadn’t sold that many memberships yet. I went to ask Bruce, the co-chair, if he could let the guy know when they reached that total. Bruce looked at me for half a second and asked, “He just wants the number?” And immediately went and sold him membership #2001. It all seemed so obvious in hindsight. Re: downloading a digital copy of something you already have. If what you are doing is downloading from a Megaupload-type of site, then I agree about ethical concerns. But if you are doing this via torrents, remember that the nature of the process is that you are also providing the bits to others who may not have legit copies. So you become the source for piracy. Megaupload hasn’t worked out so well for Kim Dotcom.